Recently I made an apple pudding from Sarah Josepha Hale, commonly known as “The Mother of Thanksgiving” in America. The recipe called for candied lemon peels. 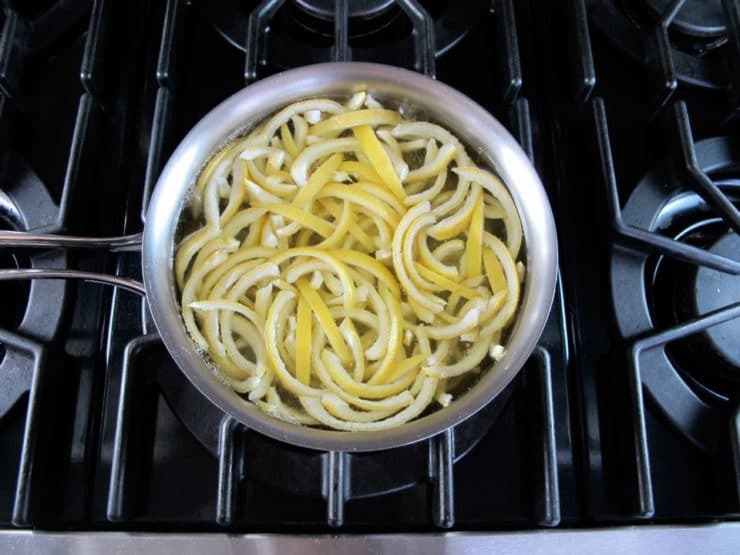 I’d never candied lemon peels before, so I looked at a few different tutorials online and read lots of reviews of recipes to determine the best way of going about it. After putting together the best aspects of each technique, I jumped right in and candied some peels. Guess what? They turned out absolutely delish! I decided to post the tutorial here on my site. It’s a fun, economical food project that you can make with peels you might normally discard. They taste kind of like chewy lemon drops. My husband is addicted. Now that I know how to make them, I’ll be setting aside my unused lemon peels when I cook and reserving them for candying. Uncandied peels will last for about a week in an airtight Ziploc bag in the fridge. 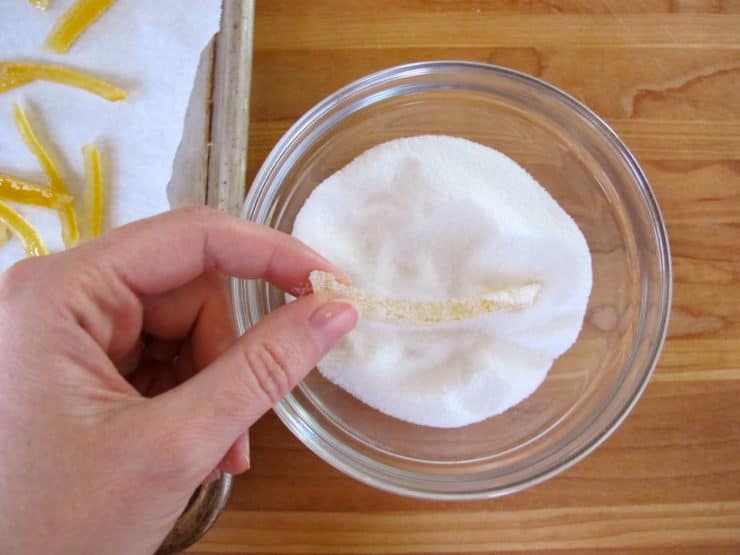 Candied peels will last for months, especially if you dust them in sugar. They’d make a super fun homemade food gift for the holidays… put them in a pretty Mason jar with a ribbon and a tag. You can dip them in white or dark chocolate for an extra special treat! 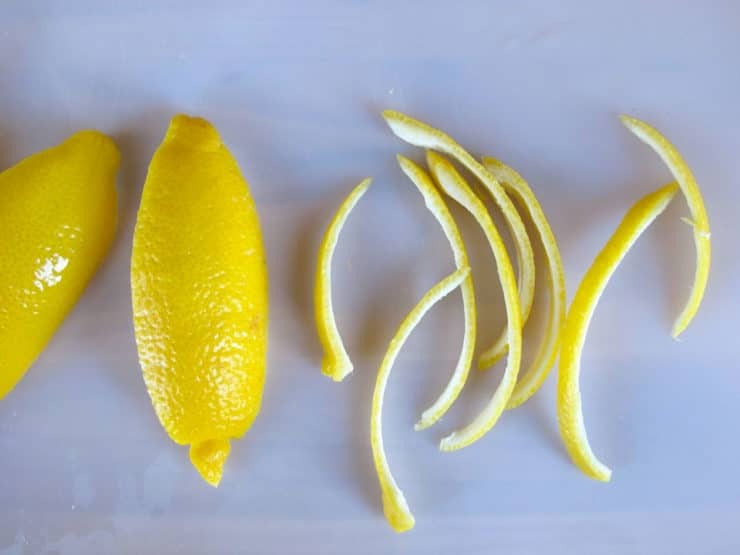 Learn how to candy lemon peels with this step-by-step photo tutorial. Easy candy recipe, only 2 ingredients required. 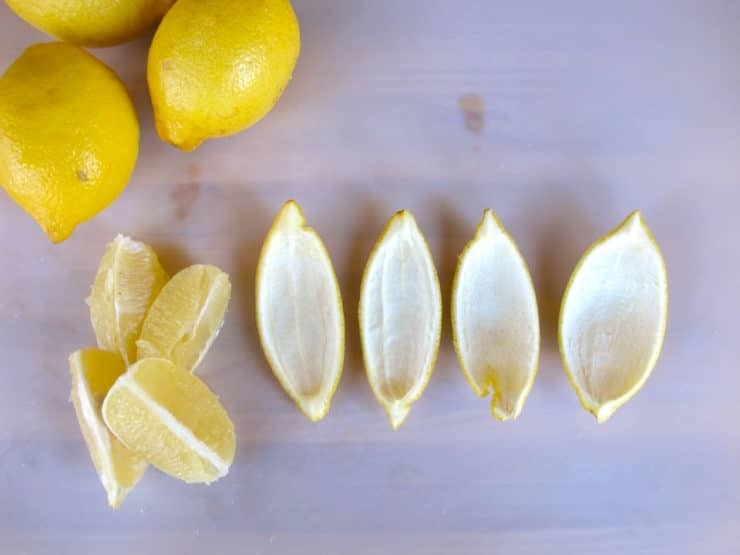 Slice the lemons into four quarters lengthwise. Peel the lemon flesh away from the peels. Reserve for another use. Use a small, sharp-edged spoon to scrape the tough fibrous parts off of the inner peel, leaving a thin layer of white left behind on the peel. Slice the peels into thin strips. 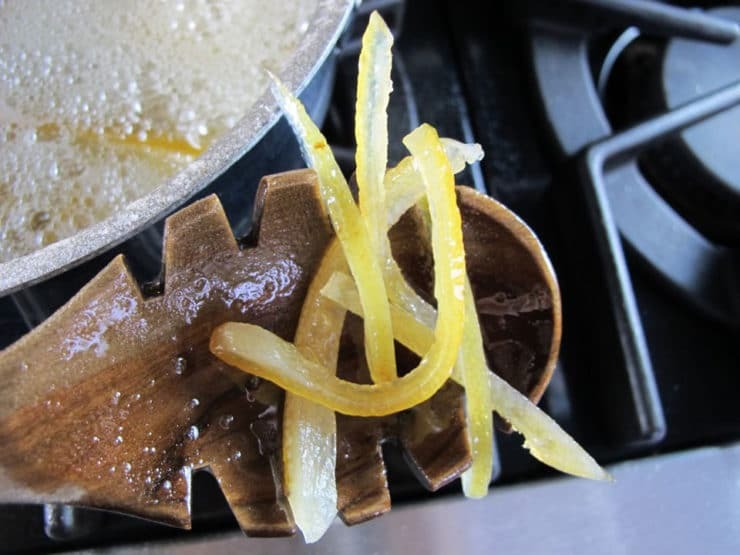 Alternatively, for thinner and daintier decorative peels, you can use a serrated peeler to scrape yellow strips from the exterior of the lemon peel. 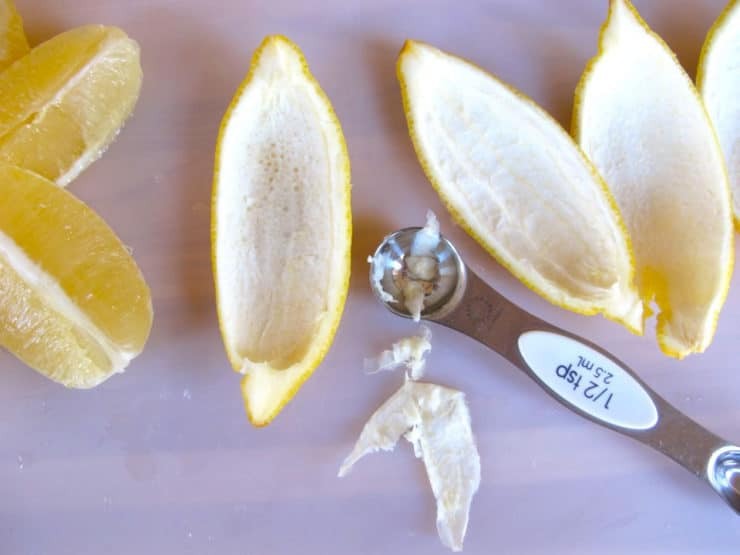 Cut those peels into thin slices. Place the peels into a saucepan and cover with water. Bring the water to a rolling boil for 30 seconds. Drain the peels in a colander. Cover with water again. Bring to a boil for 30 seconds, then drain again in a colander. The boil and drain process helps to cook out any bitter flavor from the peels. You can boil and drain up to three times, but I usually only do it twice because the lemon flavor is weakened each time you do it. 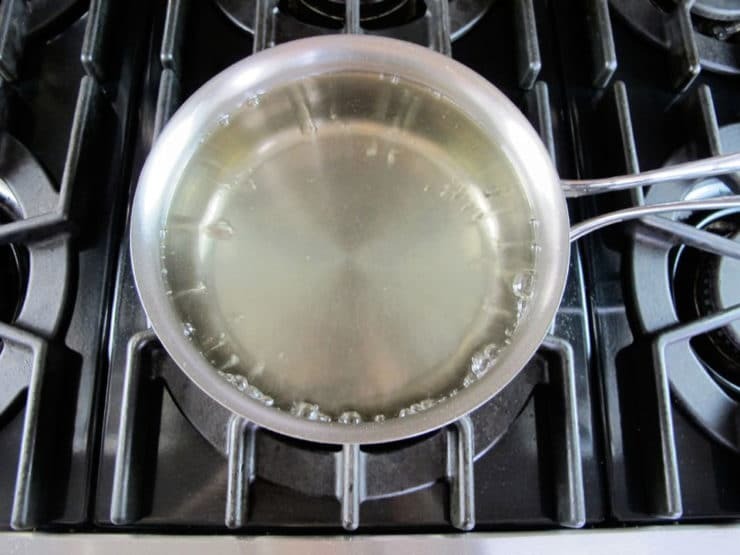 When you're finished boiling and draining, pour 4 cups of water into the saucepan along with 3 cups of sugar. Stir with a whisk while the water heats, till all of the sugar is dissolved. Add peels to the saucepan and bring to a rolling boil. Reduce heat to the a low simmer. Let the peels simmer for 60-90 minutes, stirring every 15 minutes. Different sized peels will take different amounts of time to cook. The peels are ready when they're transparent and easy to bite through. Err on the side of cooking them longer, if you're unsure... undercooked peels will have a slightly bitter flavor. Drain the peels. 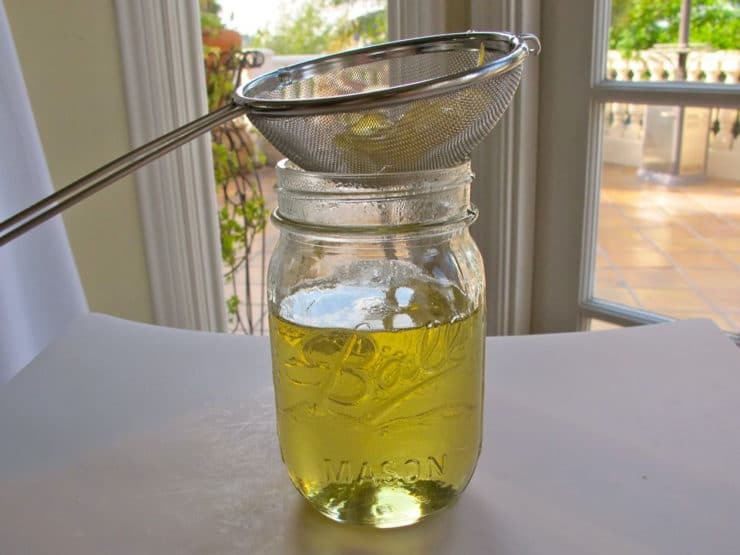 If you want to, you can strain the peels through a mesh strainer, letting the liquid stream into a jar. The leftover lemon flavored simple syrup can be used to flavor drinks and cocktails. It will be a thick syrup, and sugar crystals may collect in the jar over time. You can reconstitute the syrup by adding water and stirring over moderate heat if the syrup becomes overly thick. Line a baking sheet with parchment paper. Spread the peels out in an even layer on the parchment. Let the peels cool for about 15 minutes till tacky to the touch. Pour 1/4 cup of sugar into a small bowl. Dip the peels into the sugar till coated. Sugar coating the peels will add sweetness and help to keep them from sticking together. Alternatively, you may let the peels dry as-is for a deeper yellow color and a gel-like texture. Place the peels back on the parchment. Let them dry for 2-3 hours longer if they are sugar coated, and overnight if they are not. At this point, you can serve them, or you can dip them in chocolate. 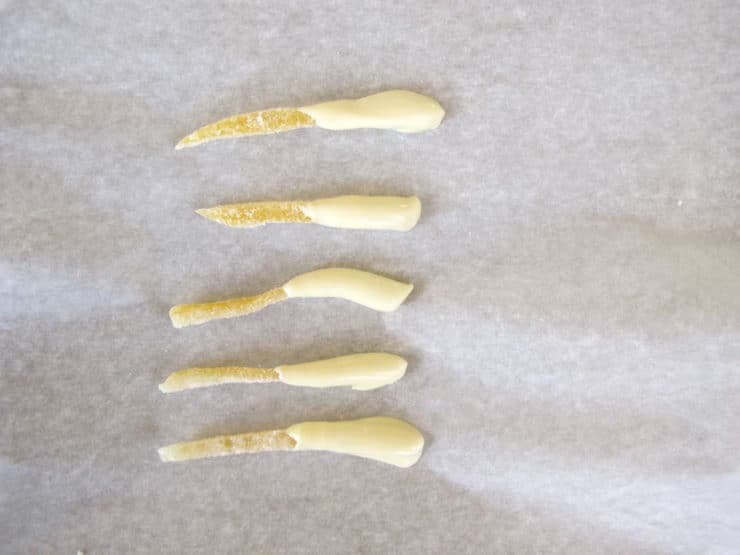 For a batch of lemon peels, you will need about 4 ounces of chocolate (dark or white). Melt the chocolate in a small bowl in the microwave for 60 seconds, or until you can stir the chocolate to a smooth consistency. Dip the candied peels one at a time into the chocolate, so they are coated halfway up the peel. 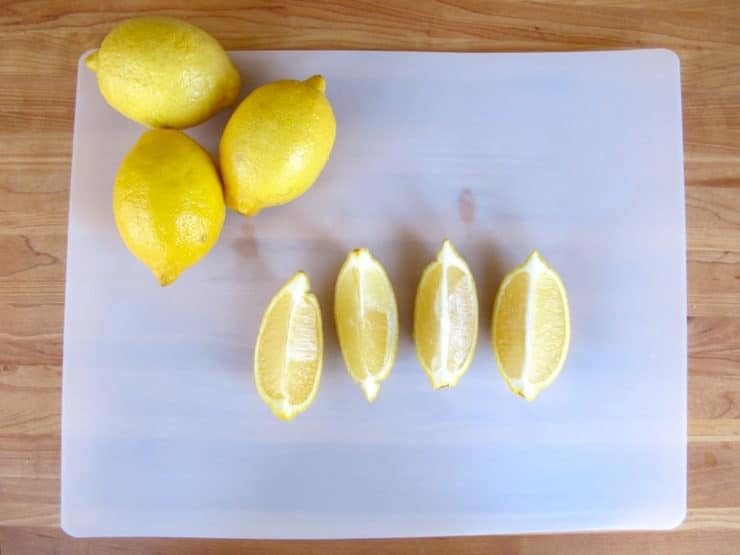 Place the dipped peels on a parchment-lined baking sheet and let them dry for 30-45 minutes. These candied peels make a great homemade gift. They will last in a sealed jar for a few months. If you're jarring them and giving them away, I recommend sugar-coating the peels to keep them from sticking to each other. Thicker peels are more candy-like, and taste similar to lemon drops. 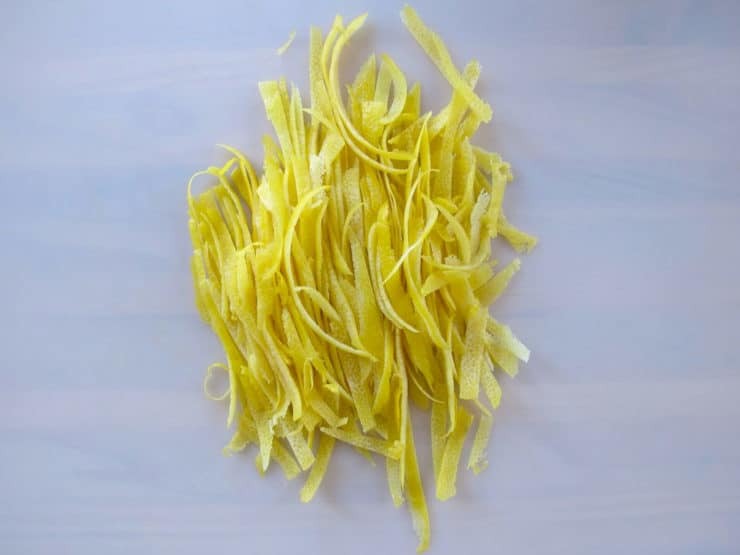 Thinner peels (using a serrated peeler) will dry curly and slightly crunchy. 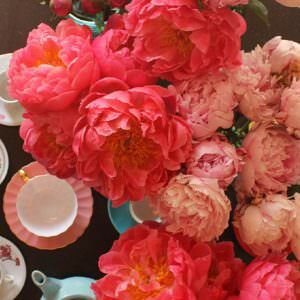 They're perfect for decorating daintier dishes like cakes and cupcakes. The chocolate-dipped peels are a personal favorite of mine. I especially like the lemon peels dipped in white chocolate. These were fabulous! I cut the strips quite thin because I was going to finely chop them for a cookie. I ended up letting them dry on the cookie sheet for 2 days before putting them in a container. I never added sugar because they were so flavorful! If I did these as a ‘candy’, I probably wouldn’t sugar them either before dipping in a light layer of chocolate. The one thing I’ve hated about candied peels is the overwhelming ‘sugary’ flavor which buries the citrus flavor. Hi. 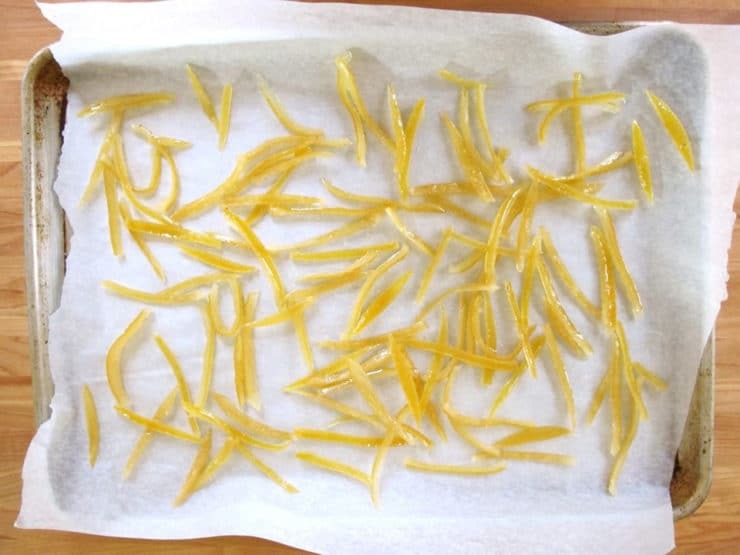 I made your candied lemon peels (with home-grown blood orange peels) and I was wondering, is it possible to vacuum seal them for later use? I live in Australia and want to use them in Christmas cakes I expect to make several months from now. They’re very delicious. Like what we used to call fruit jubes in texture and with an incredibly intense flavour. Hi Gab! I don’t have much experience with vacuum sealing, but I would think it would probably work well for this. The sugar is a natural preservative. But you might want to get a second opinion from somebody with vacuum sealing experience. Glad you like the way they turned out! I haven’t tried them yet as my lemon peels are still drying, but I already know this is going to be my new favourite! I’m literally addicted to lemon water and I always hated tossing out the peels. 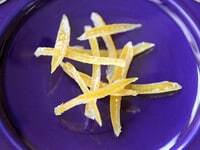 I thought about making a candied lemon peel before but didn’t think it would be this easy! I’m thickening the left over syrup right now by boiling it longer and adding some extra sugar to try making candy covered grapes! Hoping it will be similar to candy apples. I’ll let you know how they turn out. Just a quick question though, have you ever used brown sugar and white sugar together or just brown sugar? I just did because I didn’t realize I had any white sugar left until I had already started using brown sugar. I still think it’s going to turn out great but again I’ll let you know how it goes. Thanks for this!! Hi Whitney, I generally use white sugar for this, mostly for color. I think brown should work fine in theory, but I wonder if it will set up as well as white. Let me know how it goes! I’m going to blame myself rather than the recipe, since many others were pleased with the results, but both the end product and my experience was bitter. I had a really hard time scraping the pith – I went as far as I could without breaking the peels. I used a paring knife and spoon, but maybe a bristled brush would have served better. I then simmered for 2.5 hrs, until I thought the syrup was going to turn to candy, and still not all the peels were translucent. The peels were 1/4″ thick per the recipe. Maybe boiling/draining more times would have helped, but I won’t be trying this again to find out. These peels were simple to make but required a little bit of effort. I will definitely make them again. I decorated a lemon cake with them and they were a big hit with guests. I think I’ll try this method with orange peels, too. These are delicious! I am making ricotta pie for Easter, and plan to top with fresh whipped cream and the candied lemon peels! Can’t wait!! This is my new favorite recipe!! Thank you!! Question: how long will they keep in tupperware-type container? Unfortunately, when I got done with it, I ended up with very very bitter Lemon Peels and followed the instructions to letter. Hi Epsilon, that is strange. If you read through the comments you’ll see that others have had a much better result. Did you boil and strain the peels once, twice or three times? Only once can leave you with bitter peels. Twice usually takes the bitterness out. You can do it up to three times without losing too much lemon essence. You can actually taste a peel after boiling and draining to see how bitter it tastes; if it is still bitter, feel free to boil and strain again until the bitterness is removed. Good luck! I’ve been trying to find something like this for a few year now. Mother, rest her soul made some candied lemon wedges for me once. She took her method to the grave and I haven’t had a taste since. This looks the closest to what she made. I don’t know why but the end result was a disc shape. She used the whole lemon too. For the life of me I can’t figure out how she did it! Would the candied lemon peels come out as good if I use artificial sugar like stevia rather than real sugar? 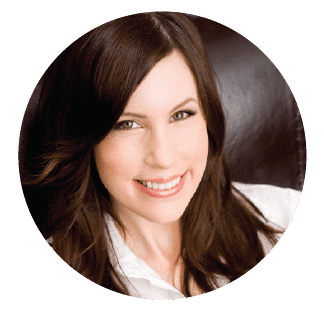 Hi Sarah– I have not tried this with stevia, but I don’t think it will work because sugar has preservative properties that stevia lacks. I don’t believe it will “candy” the same way it does with sugar. Great question, Mary… honestly I’m not sure. Definitely worth trying! i LOVE your site more and more!!!!!!!!! at this time of year psycopathy kicks in because three lemon trees, eight orange trees, and six tangerines are dropping all their fruit at once and the grapefruit still has 10 to 20 globes left. i truly hate waste and now i have something else to do with the trash cans full of citrus peel besides trying to compost them which takes a looooooonnngg time. my handicapped daughter can use a hand squasher to do the juicing and the lemon peels survived well enough to transform into delectable edibles with this magical recipe. thank you soooooo much!!!!!!!!!! the limones mexicanos are easier to handle than the meyers but i didn’t know if the thinner skin would be problematic in the sugar bath. nope, not at all they work great in this recipe and in the preserving with salt recipe as well, i did not alter either recipe and they are great.. thankyou again. Hi Ruth, it may work, but I would worry that the syrup might become overly thick with prolonged cooking. You may need to add some water to thin it out a bit if reusing. Also, be sure to boil the peels twice in clean water beforehand– don’t skip that step or you’ll end up with bitter peels. Tori, we loved these thanks for the recipe! I was wondering though, what could I use the syrup for exactly? I was thinking of slicing up the leftover lemons and making lemonade but I’m thinking the syrup might be too sweet. Any ideas you have would be great! My 10 yr old grandson and I made these today. He had an unexpected day off from school and we decided to make homemade lemon drops. The drops came out great! 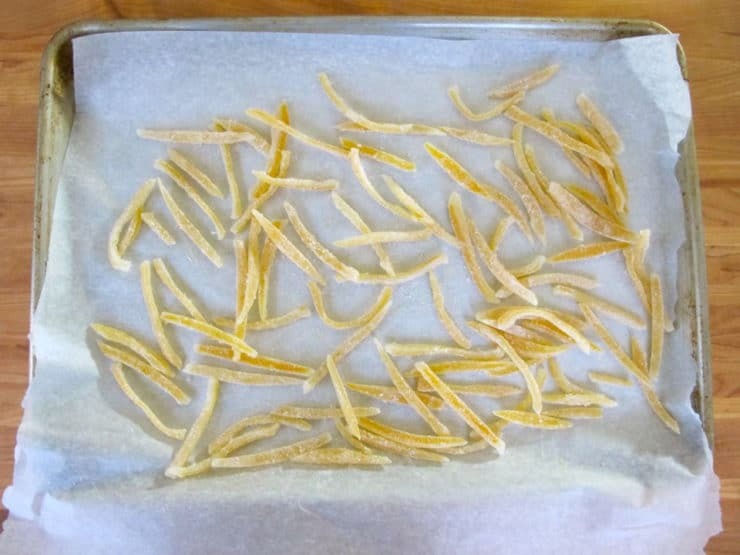 I hate wasting anything so we saved the lemon skins and made these candied peels. They came out perfectly! I flavored the sugar with lemon extract before dipping the peels. We had fun doing this. Next time we’re doing an orange. Thanks! I am going to try this with lemon peels. Thank you. I love these! They came out great – and it’s my first time making these. I have a quick question – my sugar is ‘melting’ and I can’t figure out why :(. It’s only 65 in the house with the heat on, and it’s snowing (again). I let them sit about 15 minutes before tossing them in the sugar. Should I let them sit longer? Hi Ellen! 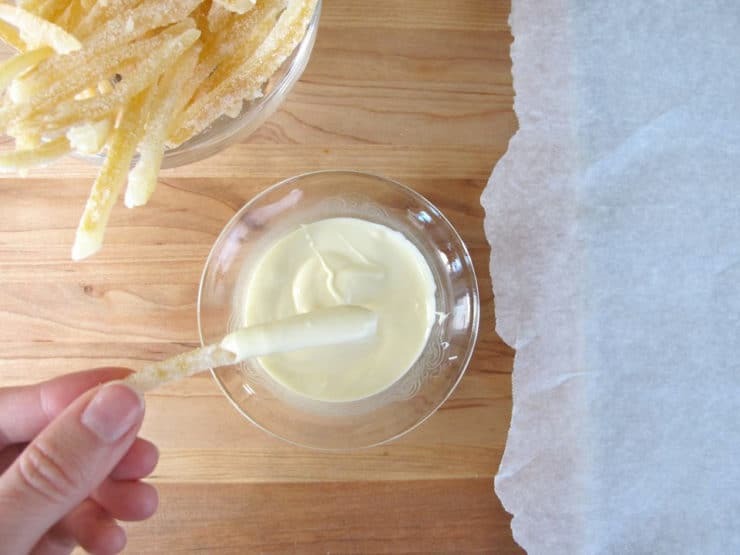 Melting sugar means your peels are still too wet. Let them dry another 10 minutes or so, then try again. Glad you like them! These look great! Should they simmer with the lid off, on, or partially on? Thanks. Thanks so much for this tutorial, and the presentation was excellent and easy to follow. My peels are cooling as we speak, and I’m looking forward to creative alcohol-based uses for the lemon sugar syrup. Are these suitable for mixing into biscotti? I’m making lemon-pistachio biscotti for some friends and I’ll be making my own candied lemon peels. 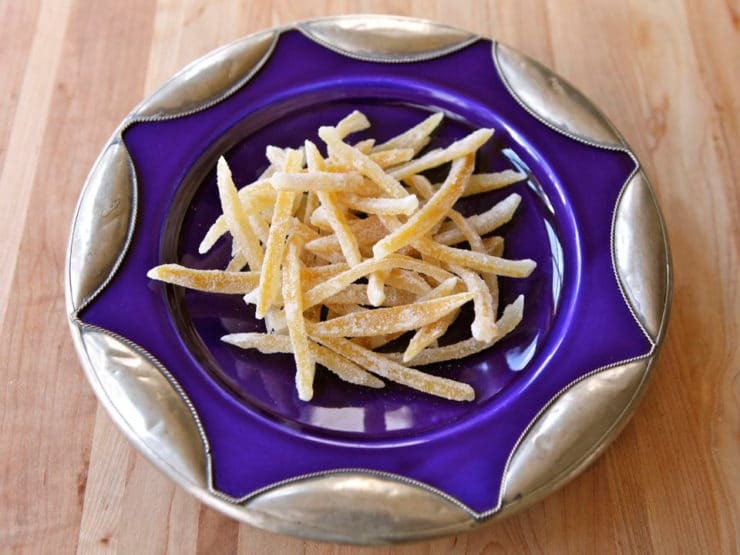 Hi Brad, this recipe produces candied lemon peels. 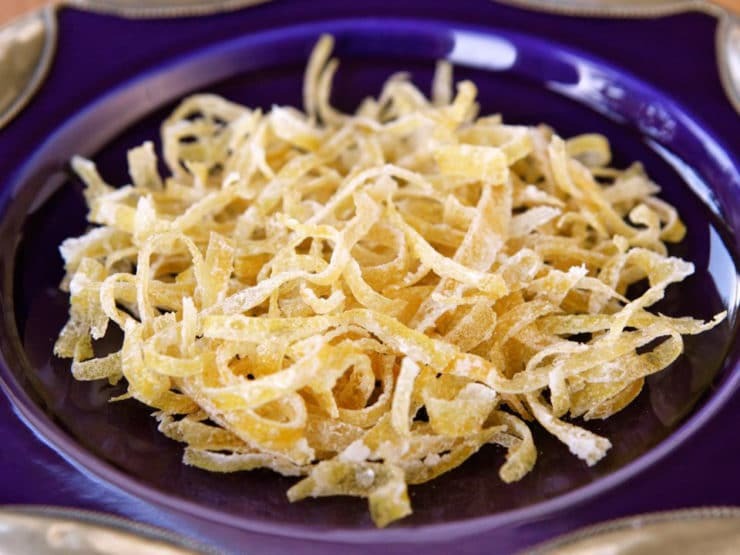 If your recipe calls for candied lemon peels, then yes, it should work out fine! It took me all afternoon, but I made them, and they turned out perfectly! Thanks so much! And yes, they tasted amazing in the biscotti. Great to hear that Brad! You don’t have to use fresh peels. As you use lemons, save the peels and let them dry out in a mesh bag or in the fridge. When you’ve saved up enough peels to candy, soak overnight in water (weighted, or fill a jar with peels and water and put on the lid) to reconstitute. They seem to me to be as good as fresh, for this purpose. You can start the recipe by boiling them in this soaking water. I also save the drained water in which peel has been boiled to use for cleaning: it cuts grease! Thank you for this post. Got crates full of lemons. 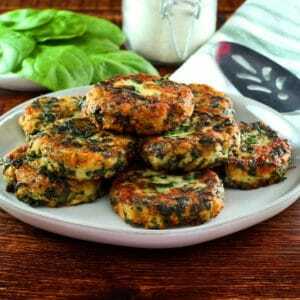 Going to make these and everything else I can find recipes for. Need to preserve all of them.Just love lemons. I really like lemon peels with chocolate. Thank you very much. I just made a batch with a lemon, a grapefruit, and a pomelo, and they turned out great! Thanks for the step-by-step instructions. The pomelo turned out the best, and the syrup is so good in iced tea. I will always save my peels from now on. I loved your version of this recipe. 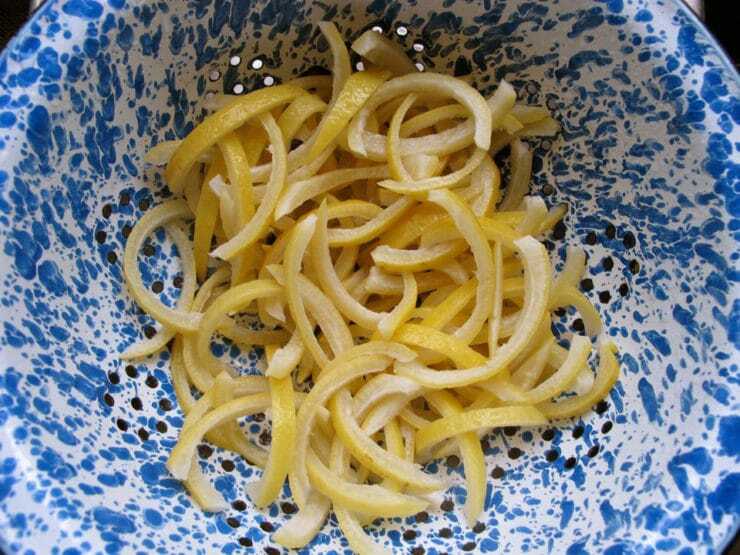 It is better not to boil citrus peel, but soak it in cold water for 48 hours changing it every 6-8 hours. Thanks so much for this how-to. I used the candied peel to add into sugar cookies. Delish!! By the way, I kept the water that I boiled the raw peels in, squeezed in the lemons, and sweetened it with some of the lemon simple syrup. Really terrific lemonade! I love these. I make them on occasion with not only lemon but orange, grapefruit and lime peels as well. I always use a cooling rack though to dry them on and always dry overnight as I normally end up packaging them up as gifts and want to make sure they are all equally dry. As you said in your post here, not all peels are the same thickness etc. 🙂 Your’s look scrummy! Oh and if you don’t have enough peels at first, I always freeze them until I have enough for a large batch 🙂 They freeze well and can go (prepare and slice before freezing) from freezer directly to pot of water as well. I made these with orange peel and put about 1 tsp citric acid in the sugar to roll them in. Heaven if you like sweet-sour candies! Thanks so much for posting this. my favorite candy my entire life is dark chocolate covered orange peel, would your recipe work for oranges as well as lemons? Hi Nancy– yes, use 3 oranges in place of the 4 lemons (oranges are larger and will have more peel). Otherwise, the process remains the same. Enjoy! I just LOOOVE them!!!! But where do I store that delicious lemon syrup????? I have used orange peels and grapefruit peels…lemon peels sound great also, thank you! Those look AMAZING, Tori! Great project for the rainy weekend we are expecting. Thanks! 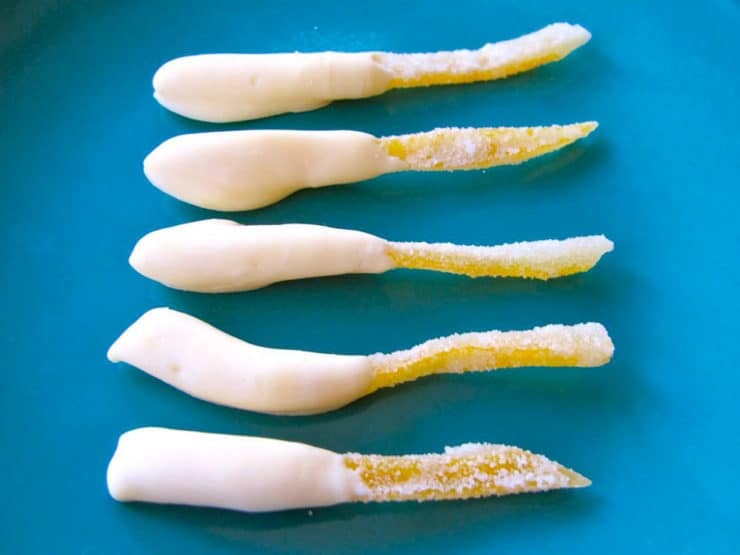 Hi Tori – those little candied lemon peels with white chocolate look heavenly, my kind of treat! Love the photo of the lemon syrup in the window! P.S. Thanks for linking the lemon risotto. And wishing you and your family a wonderful Thanksgiving!